May is always crazy around our house, and this year has been no exception, so I’m sliding in sideways at the last minute with the hot pad for this month. I think she’s pretty cute, so hopefully you’ll find she was worth the wait. 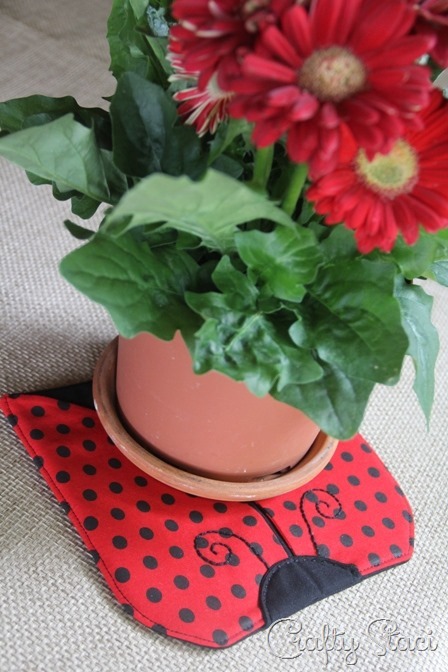 You’ll need this pattern, which is the same basic outer shape as all of the other hot pads. Be sure to print it at 100%. Cut fabric and guts according to the instructions printed on the pattern. Be sure to flip the pattern for two of the fabric wings and one of the interfacing wings so you’ll have two opposite sides. You’ll also need some black embroidery thread. 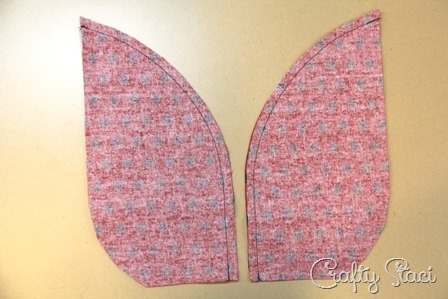 Apply the interfacing to two of the wings and one of the heads. Apply the antennae embroidery guide to the interfaced wings. You’ll need to flip it for the opposite side. I use an iron-on pen, but you could also trace it if you can see through your fabric. Backstitch along the line with the embroidery thread. Lay the opposite wing over the top with right sides together for each side. 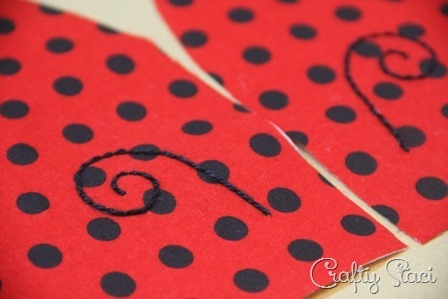 Stitch the long curved edge as shown below. Leave the other sides open. Pin the head pieces with right sides together. Stitch the curved edge. Trim the seam allowance. Turn the head and wings right side out and press. Pin well. Stitch around the outside, leaving 3” open on the longest straight edge (the top in the photo above). Clip the corners. Turn right side out and press, turning in opening. Topstitch around the outside edge. At this point I realized it was kind of cute with the head left sticking up. I decided to proceed as I originally planned, but you could certainly leave her this way – I’d just extend those antennae to the edge when stitching them in the previous step. Fold the head back tightly over the body and stitch around the edge with a straight stitch and embroidery thread. Mine got a little off center, but I decided she’s just looking in that direction. See why I was talking about bugs last Friday? I hope you can find a good spot for this summery gal!